We received the call precisely when we were concluding the Central Opposition Coalition reunion and were displaying our unconditional support of our leader, Idania Yanez Contreras. “They have to give her back! They’ve made them suffer far too much already,” my wife Yris exclaimed, full of tears and clearly bothered. “Let’s go to Los Arabos,” Idania and Yris exclaimed in unison. Yirisleidys Alvarez Perez. 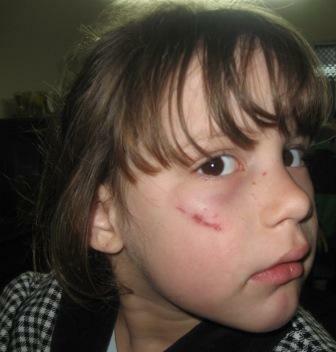 The young girl was returned to her father, Carlos Alvarez, with those scars and bruises on her face. Alcides, Idania, Yris, Adriano, Columbie, Francisco, and I all hopped into the car, where we were only able to get as far as Santa Clara, for there was a strong police operation underway. Those of us who went were strategically chosen due to our individual representation of the provinces which took part in the event: Matanzas, Sancti Spiritus, Ciego de Avila, and Villa Clara. Our brother, Tur Valladares from Cienfuegos, could not join us due to health reasons. Along with the cold which chilled our bones in Santa Clara, we were joined by Guillermo, Frank, and Carlitos. In the railroad terminal for Colon, we were also joined by Joseito and Carlos himself, and we traveled to Colon, where the same police operation was taking place. They did not want to give him his daughter back until he pulled out his ID Card. This was a condition the father did not accept. With a hunger strike, along with our support and the support of other compatriots — the Lady in White Alejandrina Garcia, Lazarito, and Cari — there were more than 20 of us in that display of solidarity. Three hours had not even passed when State Security major Alejandro knocked on the door to tell Carlos to go to Los Arabos to pick up his daughter. Yris, Idania, and Alejandrina all accompanied him, and they were all witnesses of that emotional moment where a desperate father once again embraced his daughter after 4 months of absence and separation. The young child had scars on her face. That moving scene put an end to the “Return Yili to her Father” campaign, which had been launched by the Rosa Parks Feminist Movement for Civil Rights and counted with the support of many Cubans in and out of the island which joined in solidarity through this unforgettable drama. That is the Coalition, that is unity, and those are the results. And that is our response to those who, for matters of greed and other grave reasons, never cease to attack us. In Cuba, all he has are a sixth grade education and his sixty years of age. Blas Fortún is one of those rare human beings. If a mission is necessary to the East of Cuba, it is Blas Fortún who offers to go. If something has to be taken to a prisoner, you don’t have to ask him to do it, it’s not important if it’s very cold, if it’s raining, or a hurricane is approaching. If you have to go to a place to protest, march in the streets of Santa Clara, go out to yell “Down With Fidel!”. His health complaints aren’t important to him, even when he hasn’t been able to recover from the cold and then hot cells in which they put him after that arrest in Santiago de Cuba. It is useless if we beg him to at least drink water during arrests in the cells, from there he’ll get out looking like a skull and won’t beg for mercy, from there he’ll get out, ready for the next action. Carpenter, mason, repairer of water leaks, painter, electrician, always ready to lend a hand not just to the fellow dissident who needs something, but to anyone, although it might be the first time he’s seen him. In Placetas, many blocks have the mark of this multi-talented Cuban, to whom one will call for a fix or repair of whatever kind. Like we say in good Cuban, “he catches everything himself, and whatever pain he feels is like yours”. He isn’t well known but this doesn’t bother him, his is to do what his conscience and heart dictate to him. If the opposition hadn’t existed, he would have created it, because this is the most rebellious Cuban I’ve ever met. What he is at home, in the street, in the jails, and during interrogations you have to see as this older man who, without much formal education but with astonishing information, drives his repressors up the wall. In the afternoon hours of the 7th of December, the neighbors of the Las Minas neighborhood in Placetas showed themselves to be extremely indignant with the police and State Security. But this time, ire and indignation did not have anything to do with police brutality against those who, in my house, were founding the Academy of Overcoming and Civic Struggle of the Central Opposition Coalition; but because this time the fleet of uniformed gendarmes who spent the night from its early hours in the hallways of the guarapera deprived the locals of their daily and miserly sustenance, the breads and croquettes that are sold there. “They’re starving! They didn’t leave even croquettes for us, and those are State Security!”, said a passerby. “What they are is starving gluttons, now they leave with their bellies full and if they’re hungry, in the unit is their hot potato, or they’re going to a tasting or they’ll simply buy one in the shopping“, said another. “All those gluttons and abusers are over there!”, was heard being said by a drunk in full delirium. It was summed up by a young man exclaiming and motioning so everyone could see him, “That tool, Major Vega was eating them by the fistful, and that Captain Pedro Perez must be getting over extreme anger, he came from Santa Clara to kill an old hunger, those soldiers ate everything!”, he said, withdrawing before the sarcastic laughter of approval from all who were now close to the famous guarapera of Las Minas in Placetas. The subject of suppressing or maintaining restrictions of short trips to Cuba isn’t even going to be discussed. I imagine how, in the first place, the bankers and businessmen must feel who are rubbing their hands together to destroy our resources and widen the gap between the haves and the have-nots, from those who receive and those who cannot receive. Tremendous fiasco for those who do not have faith in the strength of those who fight, who put their hopes on the financial and economic things. Spirit for those of us who are more than convinced that it’s a mistake to oppress our future in plots and in foreign governments and that whatever measure that might result in the perpetuation of tyranny is as damaging as tyranny itself.